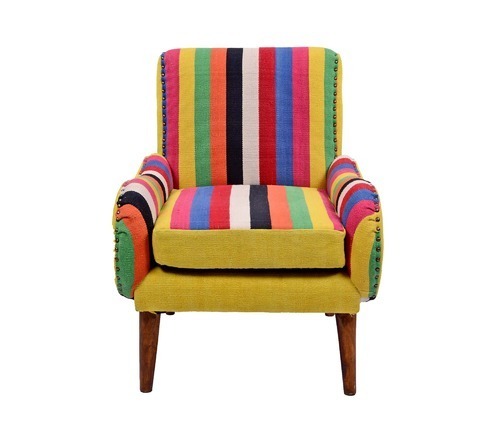 The Accent Chair with Nail-head features beautiful multi-color stripe look fabric upholstery. Blending modern and retro style, this piece updates any living room furniture. Multicolor stripes motif updates your office or home décor. Settle in front of a crackling fire or a glowing TV set with sturdy support and luxurious comfort in a refreshing style. The curved arms of this chair feature a very comfortable, classic mid-century modern design. The furniture is versatile enough to function equally well in the living room, dining room, or bedroom. Established in the year 2015 at Jaipur (Rajasthan, India), we “Natural Furnish”, are devoted towards manufacturing and supplying the finest quality range of Pattern Rug, Pillow Cover, Wooden Furniture, Pouf Cover, Stationery Storage Box and Pouch And Wallet. These products are widely demanded for their sturdiness and attractive look. This Pattern Rug range is woven using high quality thread and yarn by our expert professionals. We also offer hand woven rugs which are woven by our expert weavers. Pillow Cover are designed using supreme quality fabric and latest techniques. Decor And Accessories, Wooden Furniture and Pouf Cover range is designed using quality-approved basic material and sophisticated techniques. This offered range is highly demanded for its attractive design, longevity, perfect finish, eye-catchy colors and easy to clean features. Furthermore, we have a stringent quality check unit which is managed by our quality controllers. Our quality controllers check the offered range against predefined quality parameters to offer an impeccable finish and to achieve maximum clients’ satisfaction.